HomeMilitary Monday: Charles J. Lowry Wounded! 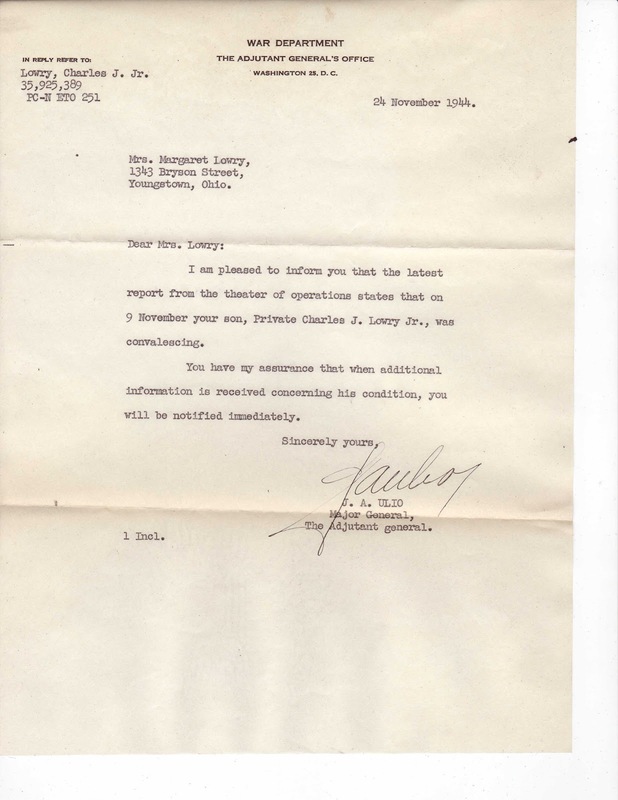 Military Monday: Charles J. Lowry Wounded! I am fortunate to have numerous records, photos and information regarding the military service of my grandfather, Charles J. Lowry. Chuck had a long career as a Federal employee, which included almost two years in the United States Army. Charles was wounded on 28 August 1944 during the early stages of Battle for Brest, France when a hand grenade detonated near him, causing the ammunition he was carrying to explode and sent shrapnel fragments into his legs. He had been in France for eight days and on the front line for three hours. He was lucky if he knew the first names of the men he was fighting with. Friendships were non-existent for replacements (later called reinforcements because of the harsh connotation of the word ‘replacement’ in a military unit that had suffered casualties). The chance a replacement would be wounded or killed in his first 14 days of combat was nearly 70%. A scrap of paper was found among the documents from Chuck’s time in the service providing a timeline from the time of injury until he was provided definitive care. He was hit at 7:35 a.m. and stated he spent three hours in a ditch before he was picked up. Chuck had previously told me that he was lying in a ditch during that time, taking cover from German fire. By 3:30, he was removed to the 101st Evacuation Hospital, which operated in France in 1944. The ‘666th Air Strip’ was probably the 666th Medical Clearing Company, operating evacuation flights from Morlaix, France (about 36 miles from Brest) back to England. Once in England, Chuck was treated by the 128th General Army Hospital. He stated it was near Devizes, but the 128th was situated near Bishopstrow, about 20 miles away. It was a week from the time of his injury until he was able to have surgery that provided traction to his femur injury. A letter dated 24 November 1944 from Major General James Alexander Ulio, the Adjutant General of the Army indicating that Chuck is ‘convalescing’ at the hospital in the Theatre of Operations (England). He was then transported to England for care and eventually to Billings Army Hospital at Fort Benjamin Harrison in Indianapolis where he spent nearly a year in recovery of his wounds. 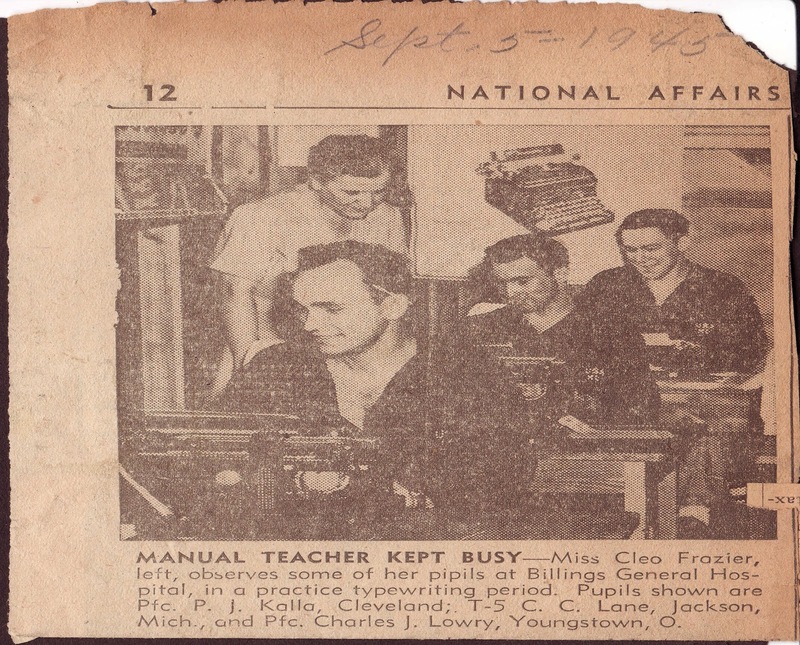 During his rehab at Billings, Chuck was featured in the newspaper taking part in a typing class. I’m not sure what newspaper this is. 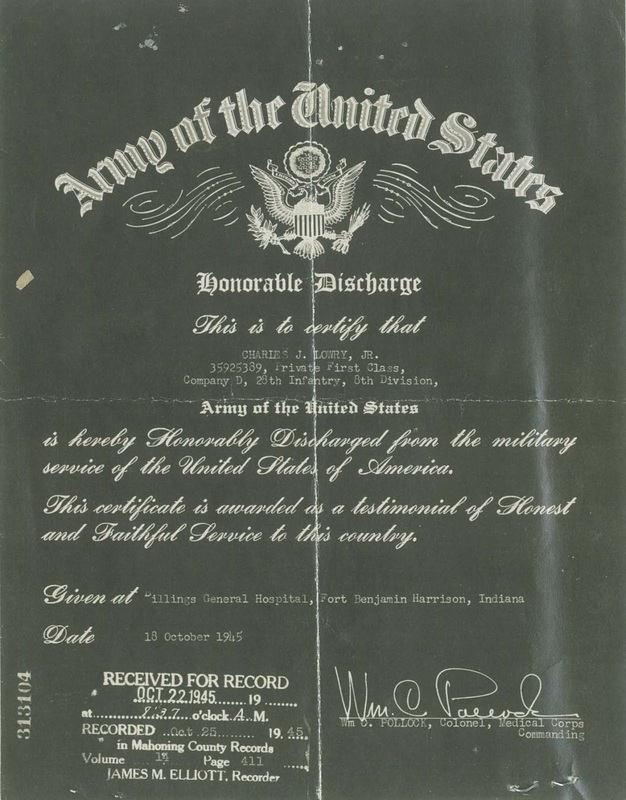 Chuck’s Honorable Discharge papers from the United States Army dated 18 October 1945.